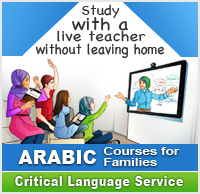 We started our online Arabic class with the Critical Language Service a few weeks ago via Skype. Only three of us in the classroom. Just like a normal classroom, we interacted with the teacher live and direct as if we were sitting in the same classroom. The teacher used a whiteboard to explain the lessons so that everyone could copy and practiced the Arabic handwriting at the same time. The teacher always asked us to repeat the words and asked us to make short sentences in Arabic language.